These parts started as metal powder. THE relatively low-tech process of powdered metallurgy sintering is still one of the most practical and economical for volume production, according to Stephen Bain, general manager of Shorlube Industries . "We see people torturing metals in complex CNC setups, when we can supply the finished part, ready for assembly, and possibly at less than raw material cost," he said. Starting with powdered metal, shapes are compacted in precision tooling then sintered in a furnace where the metal bonds into ready-formed components. The resultant parts are accurate enough for precision machinery and strong enough even for high-stress applications such as automotive connecting rods. Tooling costs are relatively low so P/M components are attractive to low and medium manufacturers who might otherwise resort to CNC machining. Costs are also kept down because P/M avoids the waste of machining or milling. 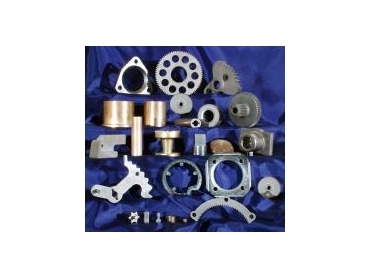 A wide range of alloys may be specified, including brass, bronze, carbon steel, stainless steel, copper steel, nickel steel, iron and iron copper. Powdered metal parts are made in Australia at Shorlube's Victorian plant.